Oregon has a vibrant industry of hemp-flower producers, but high land costs and vigorous testing requirements for hemp may hinder market expansion as other states invest in hemp production. The Northern Plains states dominate flaxseed oil production, and they have climates and infrastructure making hempseed oil production an easy pivot. New York has set aside millions of dollars to attract hemp processors, and Vermont and Maine have attracted major processing operations, too. 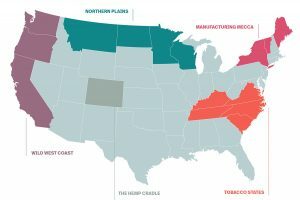 High land and labor costs mean the northeastern United States is unlikely to become a cultivation hub, but processing investments could pay dividends for an industry with limited processing options. Kristen Nichols can be reached at kristen.nichols@hempindustrydaily.com.